J Anderson, W J Anderson, J Benson, R J Lecky, W Lecky, J Lecky (jun. ), C Lewis, W Lockhart, J Meenagh, H Moore, J McPeake, H Newell, J Rainey, A Smith, W Steenson, W J Telford, W Weir, Jack Williamson, J Wolsey, W E Wolsey, H Boyd, J Davis (jun. ), Joy Davis, Samuel Davis, R J Dickson, J Doogan (jun. ), T Ferguson, T Gracey, A Harbison, T Harbison, T Henry, R Hodgett. To save mankind � yourselves you scorned to save. The design of the banner was suggested by the brethren themselves and the artistic handiwork was carried out by Mr W R Gordon, Bridge Street, Belfast, the banner being claimed to be the first of it�s kind in Ulster. On the motion of Br. J Davis, seconded by Br. R Meenagh, the chair was taken, in the presence of a large company of brethren and lady friends by Br. Rev C S Stewart, Rector of Stewartstown, and chaplain of L.O.L. 1620. The Chairman referred in eulogistic terms to the patriotic spirit shown by the lodge members, and expressed the extreme pleasure it gave him to be present on that occasion and to take part in that ceremony. During his five years� connection with the lodge, he had spent many happy evenings amongst them. 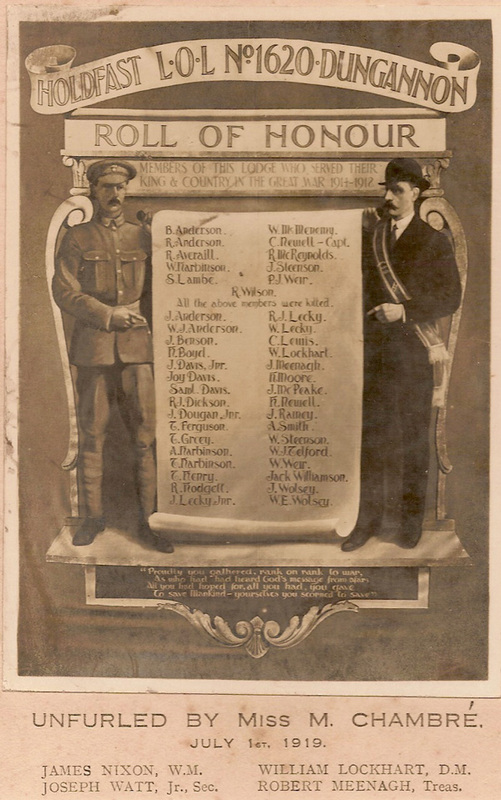 It was very creditable to find that out of the sixty members in the lodge, forty-three had volunteered, and out of that number, eleven had paid the supreme sacrifice. As a consequence of their numbers being so depleted, it was feared that during the war the warrant would have to be handed in, but the very name of the lodge �Holdfast� justified it�s existence through the untiring energy and zeal of their W.M. (Worshipful Master) Br. James Dixon, and other members. 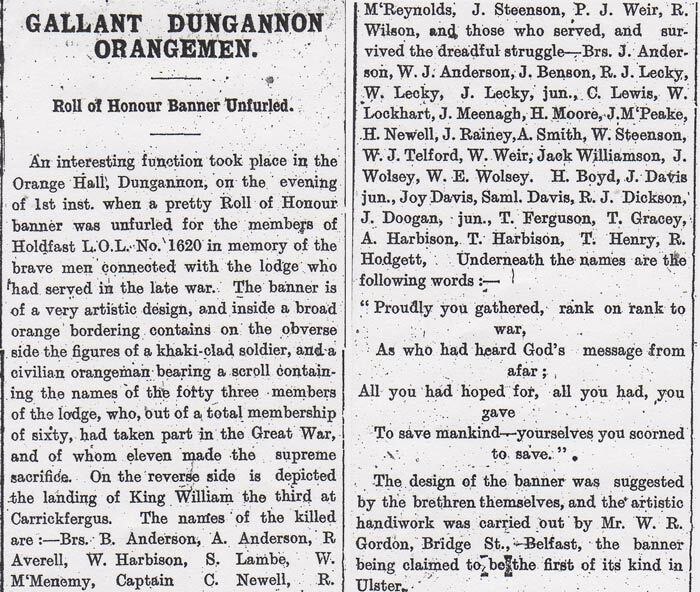 Proceeding the speaker referred to the great and noble deeds associated with 1st July, particularly in recent years, and said that those deeds and the names of the gallant lads who fell doing their duty would never be forgotten, as long as loyal hearts in Ulster beat true (Hear, Hear and applause). Br. Nixon expressed the extreme pleasure it gave him to make the presentation to Miss Chambre who was an old and tried friend of the lodge, as a token of respect and appreciation of her great kindness to the lodge. The members were very please to have her with them that night to unfurl that banner in memory of the brave men who had come forward, and done their duty so nobly in the late war, and particularly of the gallant heroes who had laid down their lives, and they felt they could not honour the memory of the deeds of those men sufficiently for the great part they had taken in defence of their country. (Hear, Hear and applause). 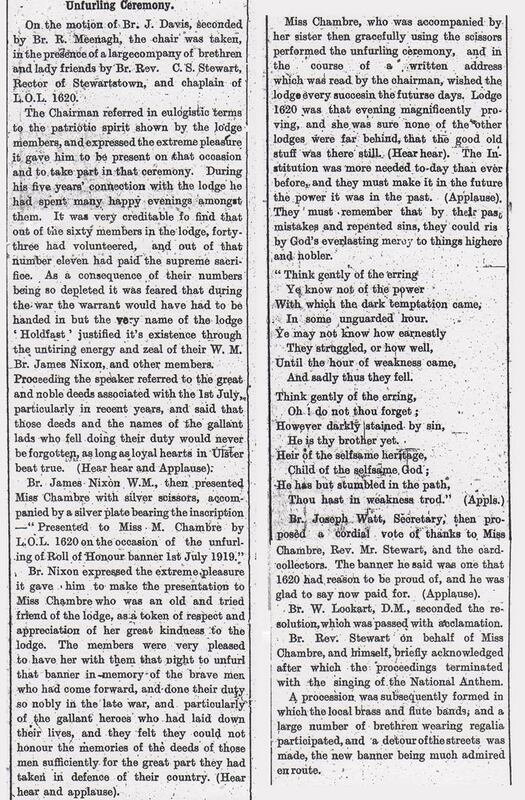 Miss Chambre, who was accompanied by her sister then gracefully using the scissors performed the unfurling ceremony, and in the course of a written address which was read by the chairman, wished the lodge every success in future days. Lodge 1620 was that evening magnificently proving, and she was sure none of the other lodges were far behind, that the good old stuff was there still. (Hear, Hear). The Institution was more needed today than ever before, and they must make it in the future the power it was in the past. (Applause). They must remember that by their past mistakes and repented sins; they could rise by God�s everlasting mercy to things higher and nobler. He is thy brother yet. Br Joseph Watt, Secretary, the proposed a cordial vote of thanks to Miss Chambre, Rev Mr Stewart, and the card collectors. The banner he said was one that 1620 had reason to be proud of, and he was glad to say now been paid for. (Applause). Br W Lockhart, D.M., seconded the resolution, which was passed with acclamation. Br Rev Stewart, on behalf of Miss Chambre, and himself, briefly acknowledged and after which the proceedings terminated with the singing of the National Anthem. A procession was subsequently formed in which the local brass and flute bands and a large number of brethren wearing regalia participated, and a detour of the streets was made, the new banner being much admired en route. NOTE: Joy Davis is listed on the Roll of Honour as a survivor. Joy Davis died of illness in Australia on 27th August 1920, although he is not listed on the CWGC.